AR6400-D MAX is a powerful next-generation all-in-one fuel system, engine, turbo, DPF and CAT cleaner. It is the culmination of years of research and the decision to combine the original AR6400-D Engine Cleaner, AR6500 DPF Cleaner and AR6600 Turbo Cleaner technologies providing the greatest value and product performance into a single treatment. All-in-one fuel system, engine, turbo, DPF and CAT cleaner. FUEL SYSTEM CLEANER AR6400-D MAX quickly restores engine performance and fuel economy lost through deposit buildup in key parts of the fuel system, engine and emission control systems. Molecule by molecule deposits are safely removed. 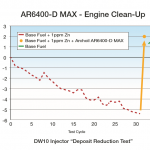 AR6400-D Max helps restore variable geometry turbo operation and diesel particulate filter regeneration. 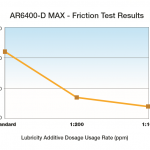 AR6900-D MAX will remove all forms of deposits from fuel injectors including carbons, varnish and stubborn lacquers. 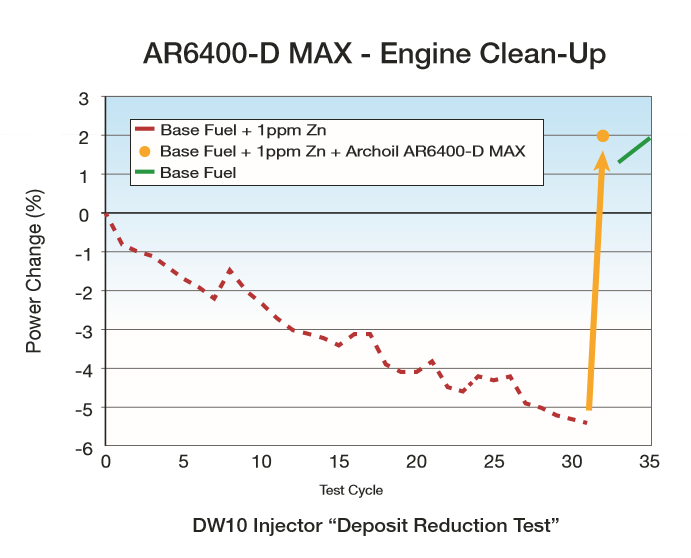 AR6400-D MAX will effectively clean older as well as modern Euro 5/6 specification fuel systems. It is suitable for all diesel engines running on pump, bunkered or bio-diesel blended fuel. 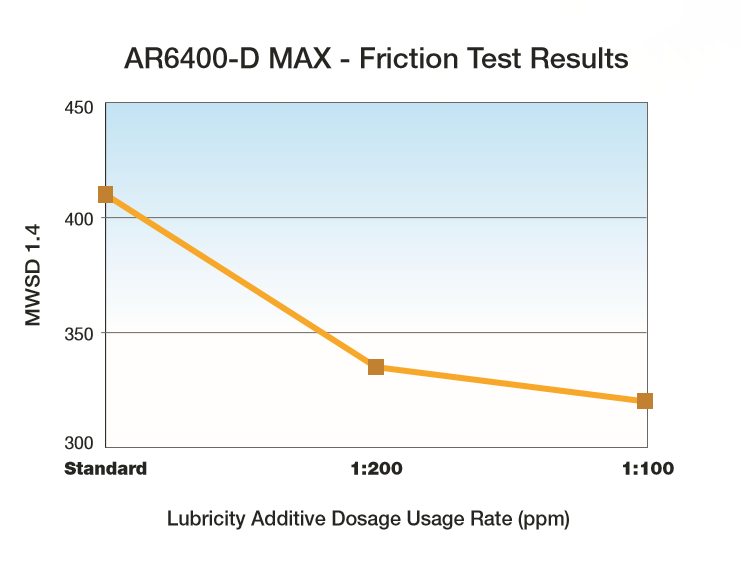 LUBRICANT AR6400-D MAX delivers a modern lubricant helping to protect high pressure injection systems and fuel pumps during the cleaning process. AR6400-D MAX contains a proven cetane booster to improve combustion efficiency and engine performance, whilst reducing engine noise. A combustion catalyst technology then facilitates a cleaner burn, improving combustion quality further. These additional functions not only provide an instant improvement in performance but facilitate the cleaning function by keeping recirculating hydrocarbons as low as possible. Then fill up with fuel immediately afterwards. Treatment ratio is 1:100 > 1:200. A single 400ml bottle will treat between 40 and 80 litres of fuel. A 5 litre container will treat up to 1000 litres of fuel. AR6400 is suitable for transport by air. 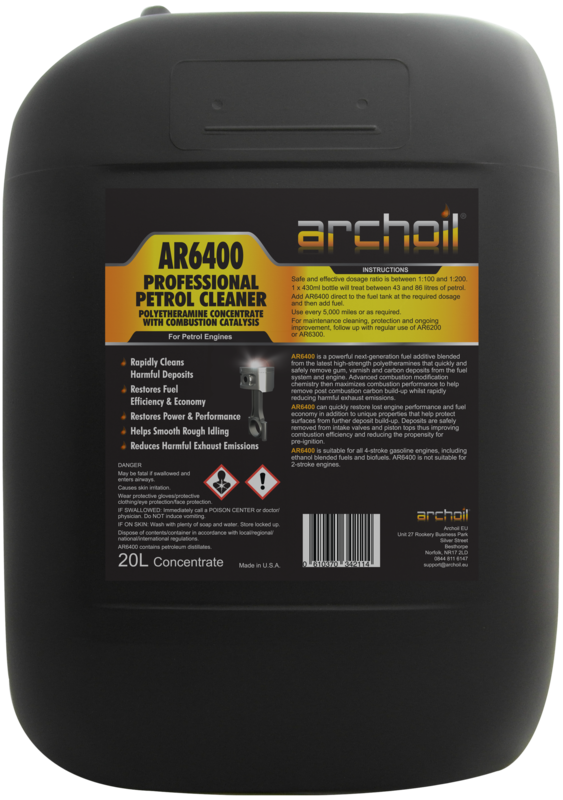 Store Archoil AR6400 in dry conditions. Archoil AR6400 can be stored for 2 years. Keep opened packaging firmly closed. Store Archoil AR6400 at temperatures between 5° C and 30° C.
Archoil AR6400 is available in 0,43L, 1L, 5L, 20L, 208L or 1000L packagings.